Since last January Germany has swiftly developed “Obama-mania”. Infact Google Trends shows Germany is 5th most popular nation searching for “Obama”. Sen. Obama’s speech, as a proud citizen of the US and a fellow citizen of the world, acknowledges this popularity. Infact almost equal count of “People” (29 times) & “World” (28 times) in his speech , projects Sen. Obama as a Web 2.0 icon. During the Bush administration, relations between Europe and the United States were often strained. 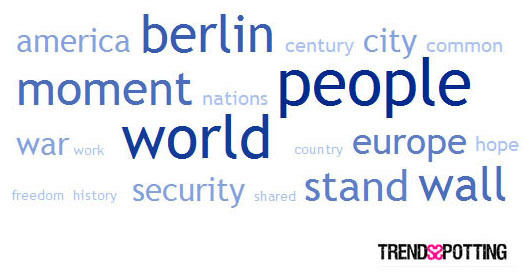 Obama’s Berlin speech underscores new hope and optimism between Europe and America. “Obama-mania” may evaporate rather quickly if the senator becomes president. However Sen. Obama’s visits throws a strong signal of an imminent improvement in the transatlantic relationship. Thanks, that is very interesting. It would be interesting to get the top 20 words of Kennedy’s speech in Berlin in 1961.